Millions United. 1 Day. 1 Voice. The 57th Annual National Day of Prayer takes place today, -May 1, 2008. The theme for this year is “Prayer! 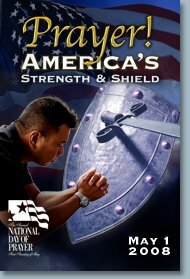 America’s Strength and Shield” and is based on the verse from Psalm 28:7 which states: “The Lord is my strength and shield; my heart trusts in Him and I am helped.” Dr. Ravi Zacharias will help lead this nation in prayer as the 2008 Honorary Chairman of the National Day of Prayer Task Force. Through the efforts of the Task Force, more than 35,000 prayer gatherings will be conducted by approximately 40,000 volunteers across the country. Several million people are expected to participate in this call to prayer for our nation, its leaders and citizens. “Lord Jesus, I confess that prayer is my weak point. I confess that I often rely more upon the gifts, talents and abilities that you have given me rather than on the gift giver. Please forgive me for my arrogance and help me to trust you more than I do. I thank you for the gentle reminder that you are in control and that nothing we or this nation can do will ever surprise you. Help us to return to our roots and place you where you should be in this Nation. Father, help us to focus more upon what is pleasing to you rather than on our failing economy. I think there is an incredible irony in printing, “In God We Trust” on our money, yet we fail to recognize that we need you to sustain our Country. I confess that as a Nation, we do not trust You. We fear the ire of our politically correct culture more than we cultivate a healthy fear for You and Your Word. Please bring a revival to our Land and help us to be the examples and witnesses that you meant for us to be. Holy Spirit, fill us with your power, convict us of our sin and lead us in the way of righteousness. I know that I do not rely upon You for my daily living and I ask forgiveness for that. I ask for grace and desire that my children follow me as I follow You. I ask that they become better, stronger Christians than I. Give us holy boldness help us the be the salt and light that our Country needs. Please cleanse us and use us a vessels usable for honorable service. I loved reading your prayer – thanks for sharing. National Day of Prayer is a pretty cool thing.